Once upon a time, when asked “What’s the best restaurant in Boston?”, Spenser (Robert B. Parker’s detective) answered, “The best restaurant in Boston isn’t in Boston, it’s Rosalie’s in Marblehead.” Rosalie’s is now out of business, but the building is very close to my house. This is my family’s memory of Rosalie’s Spinach Pie. We love this recipe, and it is completely open to many variations – vegetarian or not, lots of vegetables or not… It doesn’t work without dairy and eggs, however. This is a really fun recipe to play with – add and subtract veggies and meat options. Just don’t change the spinach, amount of cheeses, and eggs. Sometimes we don’t have zucchini, so we add extra mushrooms. Sometimes we have a picky person who doesn’t like mushrooms, so we just leave them out. I’ve frequently made 2 of these at a time – one vegetarian and one for the omnivores. It’s incredibly easy and delicious. Preheat oven to 350F. Lightly grease a deep pie plate or a glass baking dish no larger than 8″x11″. A 9×13 is too big. In a large sautée pan with a lid, warm the oil over medium heat. Add the garlic, and stir for a minute. 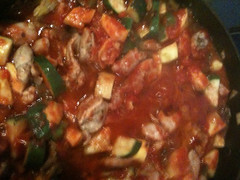 Add the mushrooms, zucchini, and bell pepper and sautée until the vegetables are tender. Add the baby spinach to the pan, turn the heat down to medium-low, and cover. Lift the lid after a minute to stir, then repeat. After a couple minutes, the spinach should be bright green and wilted. Take the cooked veggies off the heat, pour into a colander, and drain well. In a large bowl, combine ricotta, eggs, cheese, and seasoning. 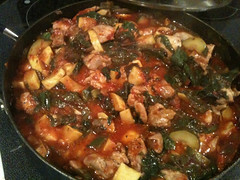 Mix in spinach mixture, then add in the sausage and/or bacon, if using. Mix just well enough to combine, then pour into the baking dish. Bake for 35-40 minutes, until the center is clearly set. Let sit for 5 minutes after baking, then cut and serve. Yum! We are now part of a CSA, an Eastern Seaboard CSA that gives us fresh (and mostly organic) veggies from farmers on the East Coast of the USA before the Farm Direct Coop starts up for the late Spring/Summer. The price for organic produce is much better through a CSA, and the food has been amazing – and seeing how much my girls like eating rainbow chard sautéed with garlic and olive oil is priceless! This is a 1-pot meal that can use up a good amount of fresh produce, and a great way of getting chard into people who might be leery of eating any dark leafy green that isn’t spinach. They don’t really have to know it’s chard! This is a delicious gfcf, gluten free, family-friendly recipe! It is also (if you double check ingredients!) a wheat free, dairy free, soy free, egg free, tree nut free, peanut free, fish free, shellfish free, corn free, and top 8 allergen free recipe. This recipe is Faux Fast Food, and can be made in under 45 minutes. Start by doing all the prep work with the veggies and the chicken. There’s a lot of chopping for this recipe, and you don’t want to end up overcooking something because you need more time to chop! Mince the onion and garlic, and set aside. Chop the chicken thighs into cubes about 2 inches long. Rinse and slice the mushrooms, and set aside. Slice the zucchini and summer squash in half length-wise, and cut into half-moons. If the zucchini/summer squash is quite wide, you may wish to cut them into quarter-moons. To prepare the chard, first break off the bottom stem, then rip the chard in half. Use a salad spinner (I love the OXO Salad Spinner, myself) to rinse the chard, then dry and roughly chop the greens. You want to have pieces that are about the size you’d use for lettuce in a salad. Place a large, deep skillet over medium heat, and warm the butter/margarine and olive oil. When the oil is hot, add the onion and garlic, and sauté. When the onion and garlic are tender, add the chicken. Stir with tongs (I use the Oxo Good Grips 12″ Tongs), until chicken begins to brown. Add the mushrooms, salt, and dried herbs to the chicken mixture, and keep stirring with tongs. 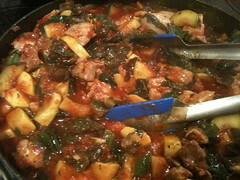 When the mushrooms start to soften and the chicken is looking browner, add the zucchini and summer squash. Stir well to combine, then cover and let simmer over medium heat for 5 minutes. Open only once or twice to stir. The steam will help the chicken and veggies finish cooking. Drain the “juice” that has accumulated in the pan. Next, deglaze the pan with about a little apple juice or wine. Stir again with tongs, then add the crushed tomatoes. Stir to combine, and let simmer for another 5 minutes with the cover on. 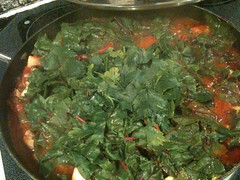 Finally, add the chopped fresh parsley and the chopped chard to the pan. Stir, cover, and let simmer for a final 5 minutes. The heat and steam will wilt the greens, and they will be perfectly cooked with little to no additional work. Stir and serve. 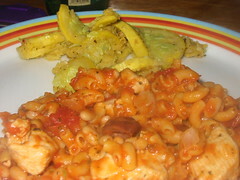 I like mine plain and with a salad on the side, but my daughters liked theirs with some Tinkyada Brown Rice Penne Pasta. Eat it up, yum! 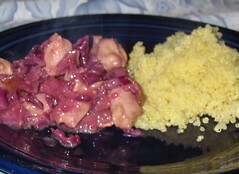 You can easily make this without the chicken, and have a lovely cabbage & apple side dish or for vegans and vegetarians. Warm oil in a large skillet over medium heat. Add onions, and sauté until they start to soften. Add chicken to the pan, and stir. Continue to sauté until the chicken browns on all sides. 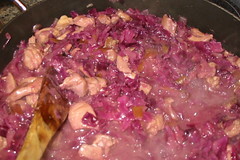 Stir the apple and cabbage into skillet, and sauté for a couple minutes, until the cabbage starts to soften. Pour in the soured milk and vinegar, then mix in the brown sugar, salt, and pepper. Once that is well combined, sprinkle in the flour/starch, stirring until well combined. 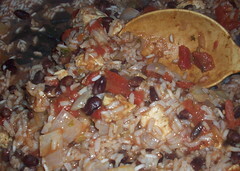 Cover, reduce heat to medium-low, and simmer for 10 minutes. Serve with some kind of starch – we like quinoa. This has a great mix of sour & sweet and different textures, yum! 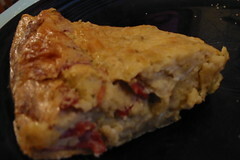 My mother started making this “impossible pie quiche” for my grandmother, and then we’ve been able to alter it to make it gluten-free and dairy-free. This tastes like quiche to me, but without needing to make a crust, and the biscuit ingredients help it stay flavorful without needing cheese. There’s no real way to make it egg-free, though, so sorry to the egg-sensitive folks! This is a delicious gfcf, gluten free, family-friendly recipe! It is also (if you double check ingredients!) a wheat free, dairy free, soy free, tree nut free, peanut free, fish free, and shellfish free recipe. 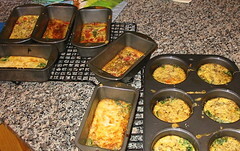 Oil a 10-inch or deep 9-inch quiche pan. In a large bowl, mix ingredients other than bacon until smooth. 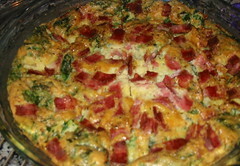 Sprinkle in bacon, and combine, and pour into the quiche pan. Bake 25-35 minutes, until a knife inserted in the center comes out clean and the top is golden brown. Between 1/2 and 1 cup chopped cooked meat: ham, chicken, sausage, ground meat, crab meat, etc. I’ve taken my Chicken and Asparagus Faux-Risotto recipe, and tweaked a few things to create this pretty and yummy dish. 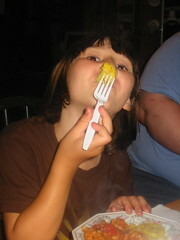 The artichoke hearts are a wonderful surprise to the diner, who had focused on the “confetti” of spinach and bell pepper. This is delicious, and I highly recommend trying it and experimenting yourself with different vegetables, and finding flavors that you and your family love. This is a delicious gfcf, gluten free, family-friendly recipe! It is also (if you double check ingredients!) a wheat free, dairy free, soy free, egg free, tree nut free, peanut free, fish free, shellfish free, and top 8 allergen free recipe. This is also a faux-fast-food recipe that can be cooked in under 45 minutes. Warm olive oil in a large skillet over medium heat. Add garlic, onion, and spices, and sauté until they begin to get tender. Chop the chicken into 1/2″ cubes, then add to the onion/garlic mixture. Cook the chicken over medium heat until browned on all sides, stirring occasionally. While the chicken is cooking, prepare vegetables – slice artichoke hearts into quarters and slice bell peppers. Add rice, coconut milk, water, and vegetables. Bring the liquid to a boil, then cover and reduce heat to medium-low. Let cook for about 20 minutes, following the guidelines on your rice package. Serve to great applause. An easy and delicious meal that mixes great flavor with fast cooking, plus it’s all in one pot! Sometimes it can be difficult to find gluten-free enchilada sauce, as many of the popular brands use wheat as a thickener. It is very easy to make your own, however, so don’t let yourself be intimidated! This is a delicious gfcf, gluten free, family-friendly recipe! It is also (if you double check ingredients!) a wheat free, dairy free, soy free, egg free, tree nut free, peanut free, fish free, shellfish free, corn free, top 8 allergen free, vegan/vegetarian, and South Beach phase 2 safe recipe. Saute onion & garlic in olive oil over medium heat. When they have softened, add other ingredients. Simmer for about 30 minutes, then adjust spices to taste. This is a delicious gfcf, gluten free, family-friendly recipe! It is also (if you double check ingredients!) a wheat free, dairy free, soy free, egg free, tree nut free, peanut free, fish free, shellfish free, corn free, and top 8 allergen free recipe. If you use brown rice or brown rice noodles, this recipe will also be fine for South Beach phase 2. Enjoy this faux-fast-food one-pot meal on a day when you want something delicious but don’t have the time or energy to make an elaborate dinner. It was delicious! Warm oil in a large skillet or pot over medium heat Add onion and garlic, and stir. When the onions and garlic have started to soften, add the cubed chicken, and sauté until the chicken is browned. Add all other ingredients and turn the heat to medium high. When the liquid boils, turn down to low and cover. Let simmer covered for 20 minutes, stirring intermittently. Test rice/pasta for done-ness, and serve with olives, salsa, and guacamole as garnishes. My friend JadenKale was chatting with me recently while eating some leftover chicken alfredo with broccoli. I don’t think I ever ate that, but my mouth was watering at the idea. I played around with my White Sauce recipe, and whipped it up. This got rave reviews, and seconds for most of the family. As I’ve mentioned before, coconut milk loses its coconutty taste when salt is added rather than adding sugar – sugar intensifies the coconut taste. The texture of coconut milk is more creamy than other milk substitutes, so it has a creamier taste than other milk substitutes. However, you can use other milk substitutes. Welcome to the world of Faux Fast Food! This dish can be on your table in under 45 minutes. This is a delicious gfcf, gluten free, family-friendly recipe! It is also (if you double check ingredients!) a wheat free, dairy free, soy free, egg free, tree nut free, peanut free, fish free, shellfish free, corn free, top 8 allergen free, and South Beach phase 2 safe recipe. Start a large pot of salted water on high, cook pasta according to package directions. Dice onion, mince garlic, and chop chicken into 1″ cubes. Break broccoli into florets, and put into a microwave safe bowl. Cover bowl, and microwave broccoli florets for two minutes. Warm oil in a large skillet over medium heat. Add onion and garlic, and begin to sauté. When the onion and garlic begin to soften, add chicken to the pan. Add spices, and stir, browning chicken on all sides. When chicken is almost finished cooking, add the broccoli, and continue stirring. When the chicken is browned and the broccoli is tender, sprinkle the cornstarch over the chicken and broccoli, and stir. Add the (optional) splash of wine, then add the coconut milk, and stir. Stir over medium heat until the coconut milk starts to bubble and thicken. Take off the heat and mix with the cooked pasta, and serve to rave reviews. This is a recipe that my oldest daughter and I created when we were trying to reach a comprimise between what I wanted to cook and what she wanted to eat! This worked well, it’s a one-pot meal that will be finished within 45 minutes, and can either be eaten alone or with a vegetable or salad on the side. If at all possible, include the kalamata olives, they add flavor and a bit of zing to the meal. This is a delicious gfcf, gluten free, family-friendly recipe! It is also (if you double check ingredients!) a wheat free, dairy free, soy free, egg free, tree nut free, peanut free, fish free, shellfish free, corn free, top 8 allergen free, and South Beach phase 2 safe recipe. Warm oil over medium heat in a large, deep skillet or a large pot. Add onion and garlic, and sauté until they become tender. Add cubes of chicken, and stir. Add seasonings, and stir, cooking until chicken is browned. Deglaze the pan by adding a splash of wine and stirring the chicken mixture. 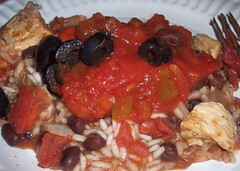 Add tomatoes, beans, and olives, plus 1 (14oz) can of water, and turn heat to high. Bring to a boil, and add pasta. Reduce heat to medium-low, and let simmer, stirring occasionally. Cook as long as the pasta needs to be cooked, then test the pasta for done-ness. Serve as is, with a salad, or with another vegetable, such as Garlic Pan-fried Squash. Enjoy!